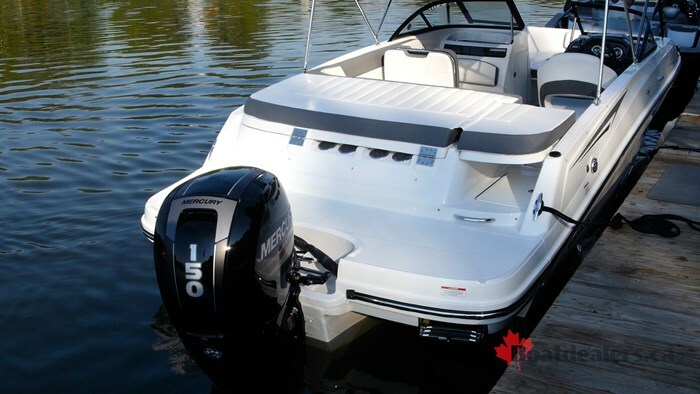 When Bayliner first introduced their brand new VR5 in 2014 it immediately began to make waves in the industry. 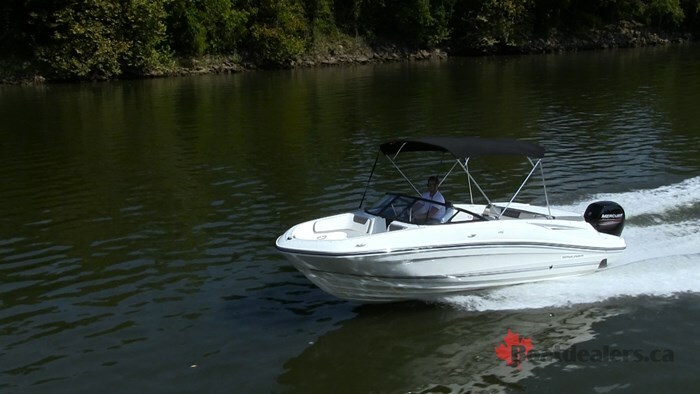 This innovative runabout was a rebirth for the brand and the beginning of something new. It was given multiple awards and the accolades came piling in. 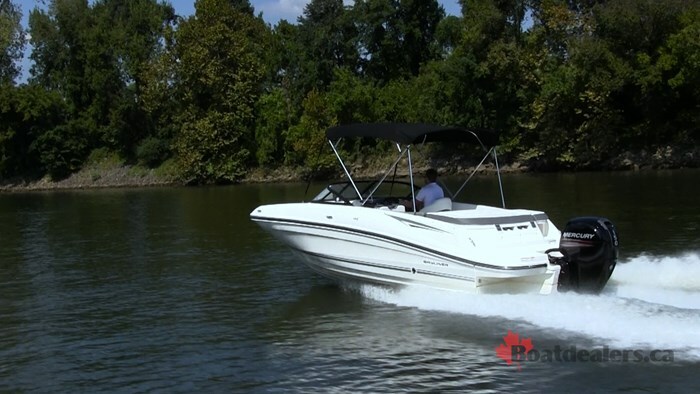 There was only one issue: it was powered by a more traditional inboard/outboard where most of the runabout market was steering towards outboard power. 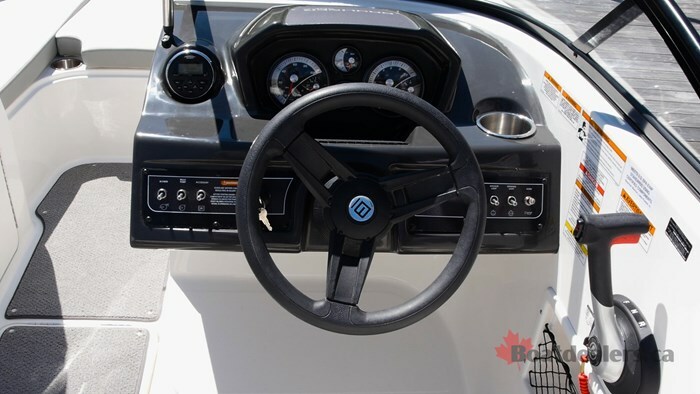 The brass at Bayliner was well aware of this, and little did we know that they had every intention of releasing an outboard powered version a couple years later. It was at their annual dealer meeting in Nashville, TN that we were able to perform a digital test drive on this new model. From the transom forward, there is no difference between the VR5 IO and OB models. They are exactly the same. If you’re new to the VR series, there are a couple things that define it so allow me, if you will, to take a few moments to take you through this series before we get into the power. What really sets the VR series apart from the pack is the amount of interior space that is packed into this 20-foot boat and the special things they do with it. But they create this space in two distinct ways which is what lead to their many awards. The first of which is something that is called BeamForward design. In the past, it was common that the bow of a boat would come to a point. 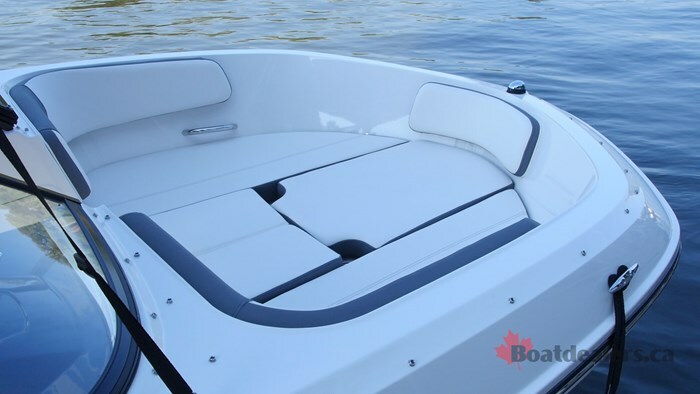 While this may look sleek and fast, the problem is it is not functional as it drastically reduces the amount of space you have in the bow of the boat - arguably the best spot! 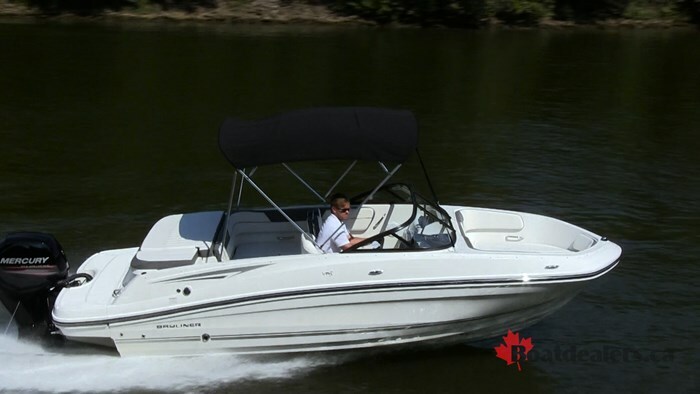 So what Bayliner has done with this VR series is they carry the full 8-feet beam of the boat as far forward as possible, well forward of the windshield, without becoming a deckboat. This doesn’t interfere with the running surface at all as it still tapers down towards the waterline to a sharp Vee to cut through the water. In fact is provides more function as that flare out from the sharp Vee to the wide bow helps deflect waves away, keeping your passengers dry. This bow space is obviously great for lots of space, but the secondary benefit is that it gives you a ton of storage. There are three seats in the bow of the VR5 OB and all three of them lift up to reveal deep storage below. 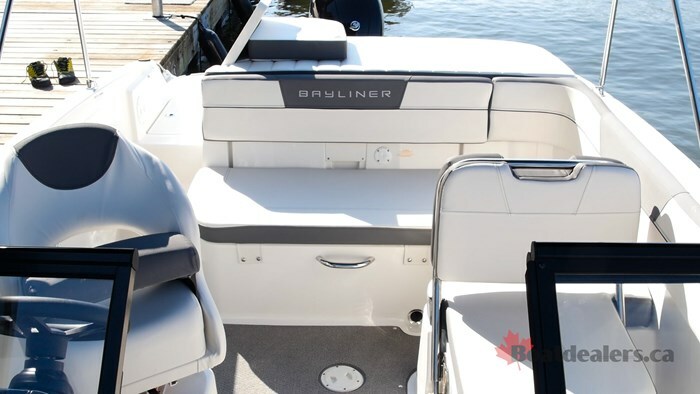 Storage is something that has always been very important to Bayliner as a brand and this VR Series is no different. We have already talked about the great storage in the bow but that’s not the end of it. The port console opens up to provide storage, perfect for optional filler cushions. There is a massive ski locker in the floor, that happens to be gel finished as well. Then the large L shaped lounge in the cockpit has storage under each of the seats, So invite your friends and tell them to bring as much gear as they want, there’s room for it all. As I alluded to, the cockpit layout features a single Captain’s chair, paired with a large, L-shaped, bench style lounge. There is a backrest on the lounger that pulls triple duty. First it can be positioned leaning toward the stern which gives you a forward facing companion chair. It can then be moved to the opposite of that which would give you a rear facing, chaise style lounge where you can kick your feet up and relax. The final position is that backrest folds all the way down to form one large L shaped bench style seat for when you have a bunch of guests on board. No matter which way you have the lounger positioned, you will never be short of space and that’s thanks to Bayliner’s AftAdvantage design. You see traditionally one of the benefits of an IO powered boat is that they have a full swim platform. The problem is this platform usually is built into the hull of the boat, taking away from the interior space. 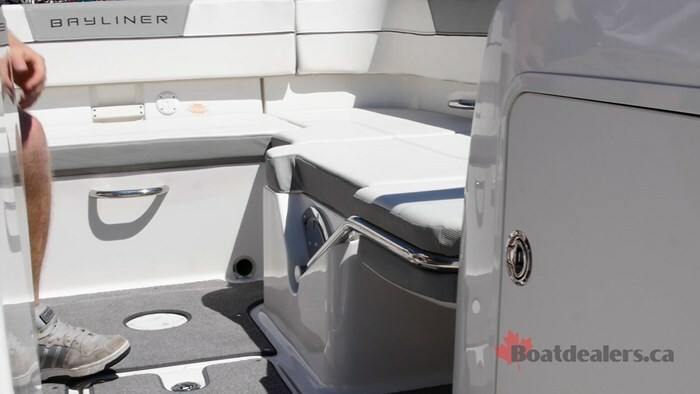 With this new VR Series Bayliner pushed the cockpit as far back as they could to the aft of the boat, stretching out the cockpit space to the absolute max. They then put on an additional swim platform at the stern of the boat. There are no negatives to this, simply more space without giving up your swim platform. 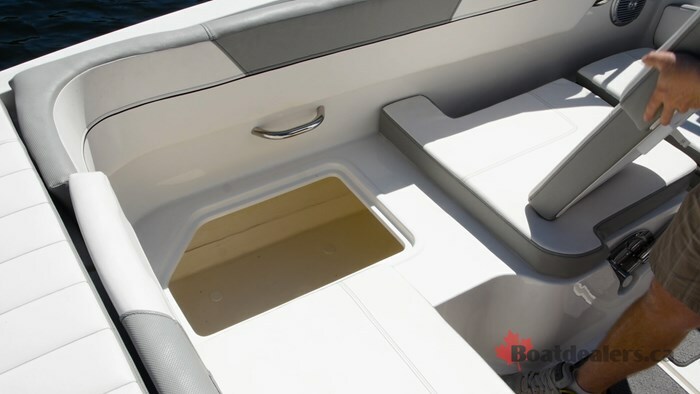 Now since this is an outboard powered boat, you do lose a bit of that swim platform, but Bayliner does a really great job of keeping that to a minimum. If I were to make an educated guess I would say you’re only losing about 10% of the overall swim platform area to the motor well. But the benefits you gain with that are so much more. Something that this VR5 had that I have come to love is Mercury’s Active Trim system. Essentially this is an automatic trim system. Now before you go and say “that’s for people who can’t trim their boat” just stop. Save your breath, because it’s awesome. The Active Trim does all the work, from the holeshot, to top speed, to the more underrated aspect of turning. Active Trim keeps you at the optimal setting for performance and efficiency.It’s like driving an automatic car. Yes I can drive standard, but it’s much more relaxing and comfortable to have an automatic - less to think about. The VR5 OB was on plane in just over 4 seconds with Active Trim on. Once we were on plane I was immediately reminded about what I originally liked about the first VR5 I tested. It’s a smooth running boat, that tracks well and is extremely quiet inside. When you’re at the helm of the VR5 you can’t help but be impressed with how solid the boat is built and how quietly it runs. You almost don’t even notice that you don’t have to yell as you chat with your companion. You can hear a little bit more of the engine with an outboard than you can an IO, but to me I don’t mind that. I like to hear the power of the motor going to work. If that’s something that is make or break for you, then the IO version might be the one for you. Rated for a max HP of 200, you’re mostly going to see this VR5 powered by the 150 Mercury Outboard. You might catch the occasional model with a Verado on it, but this is still a value boat, so horsepower isn’t as important as savings. With that said, you’re not making any sacrifices with this boat. It still performs great. It cruised wonderfully at just over 26 mph at 3000 rpm and top speed was an impressive 45 mph. Something I have always appreciated about Bayliner’s and this VR5 was no different, is how well they turn. All Bayliners turn really well, with crisp precision and minimal trim adjustments to avoid cavitation. Of course I didn’t have to worry about that with the Active Trim system. It’s nice to see Bayliner adapting with the times. With the amount of awards they won with this VR series they could have easily just said “hey, it’s good enough as is” but that’s not how you stay competitive in this business. They knew the market was favouring outboards and they adjusted by introducing this new model for 2017, bolstering that already impressive VR Series.